The presence of sagging or loose skin can be caused by a variety of factors, such as significant weight loss, a surgical procedure, or the natural aging process. While surgery is an effective way to get rid of excess skin, it is not always the most convenient option. At Youthtopia Med Spa, our Viora Reaction™ skin tightening treatment will restore the softness, smoothness and youthful glow of your skin. Youthtopia Med Spa is located in Alpharetta, Georgia and serves the north metro Atlanta area. Contact us today to schedule a consultation. 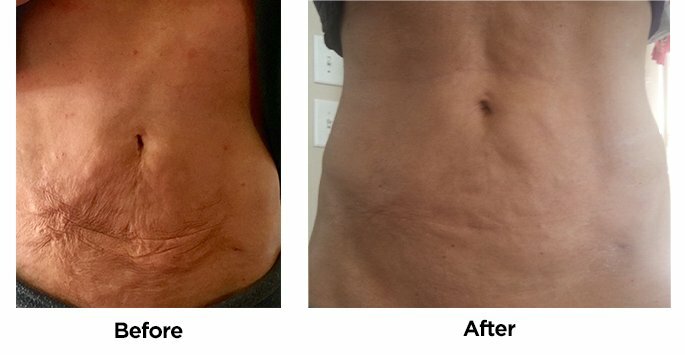 What is Viora Reaction™ Skin Tightening? On the cutting edge of body contouring and skin tightening, the Reaction™ combines advanced radiofrequency (RF) technology with vacuum therapy to stimulate the body’s natural regeneration process. The RF of the Reaction™ delivers direct heat to the dermis layer of the skin, strengthening the tissue fibers and collagen. This advanced technology, in conjunction with a built-in cooling mechanism, the RF energy stimulates existing elasticity in the skin and promotes collagen production for skin that immediately feels tighter and smoother after just one treatment. Treatment with the Reaction™ is quick and comfortable, with a feeling akin to a deep tissue massage. A treatment applicator is moved across the skin of treated areas in slow, concentration motions, with the patient feeling dual sensations of hot and cold. The heated elements of skin tightening deliver the treatment, while the cold ensures that surrounding skin remains undamaged. During your consultation, your medical history, cosmetic goals and expectations will be discussed. A spot test may also be performed on your skin to determine if your skin type and condition are suitable for Reaction™ skin tightening. If the patient’s health is deemed suitable and the spot test is successful, a course of treatment will be developed to achieve desired results. Reaction™ skin tightening is a non-invasive solution to skin rejuvenation that involves no downtime or recovery period. Reaction™ is safe on all areas of the body, including sensitive areas around the forehead, jaw and other bony areas, without causing discomfort. To date, there have been no major side effects reported from receiving skin tightening treatment. Minor redness is a common but temporary side effect. Although results are often visible after one treatment, it may take multiple treatments to achieve desired results. Check out these amazing results for this client who had 8 skin tightening treatments with our Viora ReAction! Find out how the benefits of Viora Reaction™ skin tightening can rejuvenate and revitalize your skin. Are you interested in undergoing this procedure in the Alpharetta, Johns Creek, Roswell, Marietta, Milton, and Atlanta areas? Contact Youthtopia Med Spa today to schedule a consultation appointment.